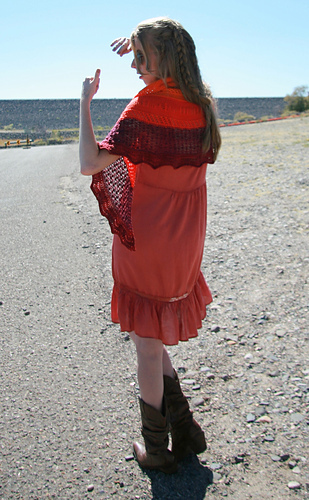 For when it is almost warm enough outside to enjoy your favorite sundress, but not quite. 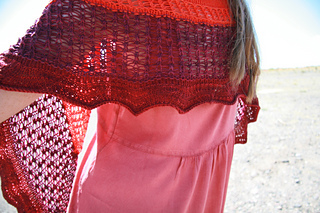 For the times when it is almost cold enough to need a shawl, but not quite. For those times when you are almost famous. 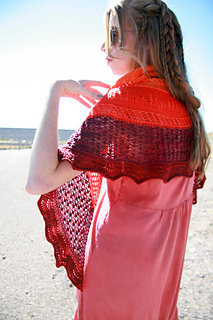 Wherever you almost are, “Almost” is the perfect shawlette accessory to take with you on your journey. Gauge: 20 sts/36 rows = 4” (10 cm) in stockinette stitch, after blocking. Gauge is critical to ensure that you do not run out of yarn and that you make the most of each seedling! Yarn: The Fiber Seed 1 Sprout Seed Pack (90% Superwash USA Merino Wool, 10% Nylon, 120 yards per color, 480 yards total), 1 set. 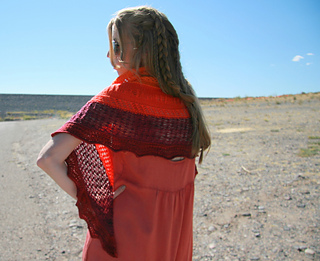 Sample shown in colorway Desert Sunset. Supplies: Tapestry needle, measuring tape, scissors. Thanks to Stitch Definition for all your help in getting this pattern together: photos by Anne Podlesak, tech editing by Chaitanya Muralidhara and pattern layout by Elizabeth Green Musselman.